Hello! I hope you are having a wonderful Saturday. It's a holiday weekend here in the United States and I know a lot of families have outdoor plans, but I am not a fan of hot weather. This weekend I'm still recovering from surgery so not much is on my agenda. Today I'm sharing my second card for the Jessica Lynn Original digital image launch. 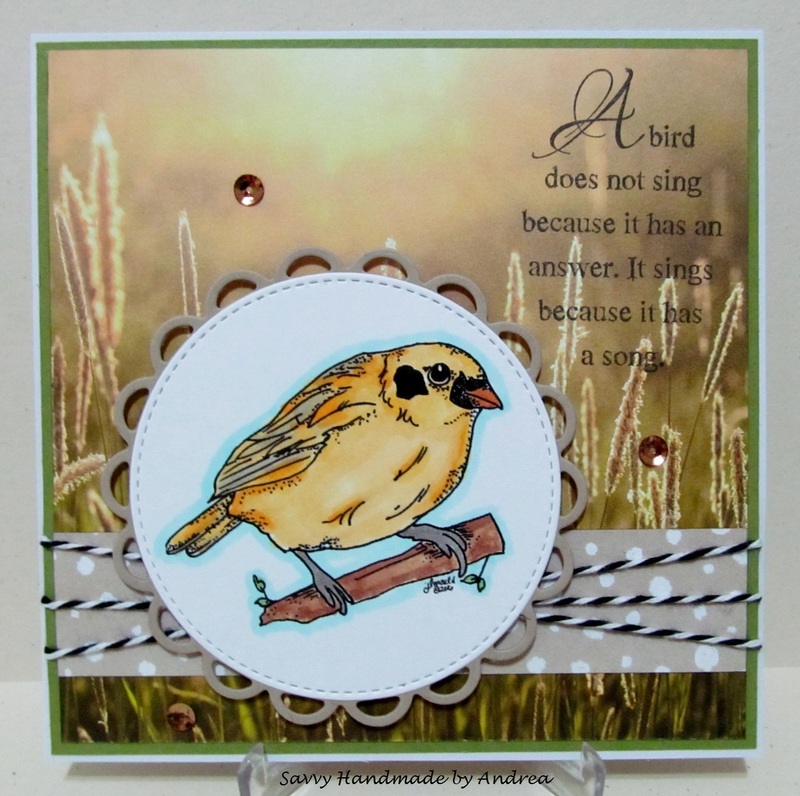 This Beautiful Finch Card features the lovely Beautiful Finch image. I have several American Goldfinches in my backyard so I decided to color my finch yellow. The patterned paper is a new one by Stampin' Up! called Serene Scenery and I thought it made a lovely background for the Beautiful Finch. Since the paper did most the work on this card I kept the layout minimal and just added a few sequins and some twine. The sentiment is by Stampendous! and I've been waiting to use it for a while, "A bird does not sing because it has an answer. It sings because it has a song." That's it! Come back again tomorrow for more Jessica Lynn Original inspiration. Lovely finch. The background is just right for the bird. Lovely card. Wow I love your beautiful paper, Andrea! It really sets off this gorgeous bird image! Wonderful card! Beautiful coloring on your image!! And that background paper is just perfect! The paper selected is perfect for your graphic. I really like the sentiment and all the embellishments used.